DiffPDF DiffPDF is an easy to use commercial Windows GUI application for comparing PDF files, ideal for office workers. It has many customizable features. Comparisons are done on your own computer to protect your privacy. Qtrac Ltd. https://www.qtrac.eu/diffpdf.html 150 Software Qtrac Ltd.
Click or drag one PDF; click or drag another PDF; click Compare. 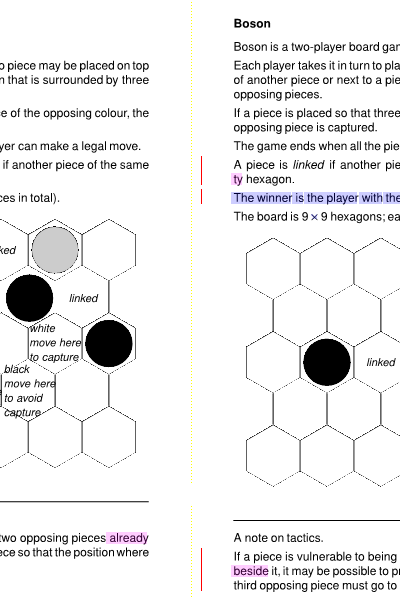 DiffPDF shows pairs of pages from the two PDFs being compared with any differences highlighted. 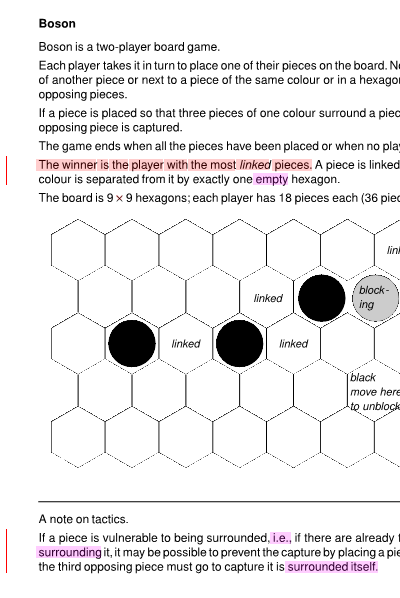 Comparisons can be made based on the text regardless of layout, or based on appearance (which accounts for fonts, colors, layout, diagrams, images, etc.) 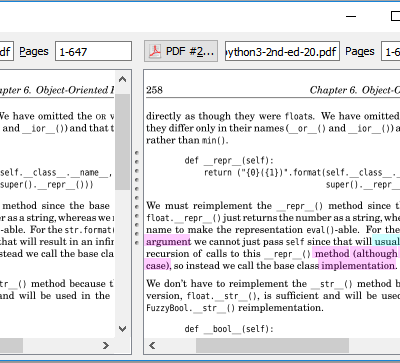 DiffPDF is cloud-free: it runs on your own computer without the size or page limits of online tools—some customers compare PDFs with thousands of pages. If you require a console-based command line tool, use comparepdfcmd. Download the DiffPDF installer DiffPDF-5.9.2-win32.msi (23 MB; MD5 e98b56e8c4168292d4464ad8e230d167) or DiffPDF-5.9.2-amd64.msi (28 MB; MD5 df678032f31df0d8d21eae4bd68b263f). Or, alternatively, download DiffPDF-5.9.2-win32.zip (23MB; MD5 c8553af4c814b0fec6ba062a7690cd10) or DiffPDF-5.9.2-amd64.zip (27MB; MD5 184235e608e234415c6e4451a175ee62). Double-click the installer and follow the on-screen instructions to install DiffPDF. DiffPDF can be used once a license key has been registered. Once DiffPDF has started, if no license key has been registered or if a trial has expired it will show the Register window. Or, if you want to buy, click the Register button to pop up the Register window. Click either the Free Trial button or the Buy Now button to open a web browser window. Click the web form's Issue License Key button. Then copy the license key shown by the web form and paste it into the Register window's Key line edit, check the checkbox, and click OK.
To buy, first complete the purchase on the secure MyCommerce website. Then go to the 'get key' page whose link will be emailed to you with the Order ID. In the 'get key' page, the Order ID will be shown. (If not, you can copy it from the payment confirmation page or the confirmation email). Click in the Register window to copy the Computer ID to the clipboard. Paste the Computer ID into the web form, and click the web form's Get Key button. Copy the license key shown on the web form and paste it into the Register window's Key line edit, check the checkbox, and click OK. If your security settings prevent the buttons from working, use one of these links: Free Trial or Buy Now. Note that each individual license key is tied to the particular computer it is acquired on. Each license key is valid for all minor and patch versions (e.g., if acquired for version 5, it is valid for all 5.x.y versions), and may be used with 32-bit or 64-bit editions. There is no time limit for full license keys—providing the hardware (and how Windows reports it)—don't change. The manual can be viewed when the program is running by clicking the Help button then the Help menu option (providing you have a PDF viewer installed). The manual is installed alongside the software (usually in "Program Files (x86)\Qtrac\DiffPDF\doc). You can also view the manual online at: DiffPDF-5.pdf (961 KB). The license is available at diffpdf-license.pdf (28 KB) and from within the program. What the screenshots don't show is that DiffPDF can produce reports—either a PDF that matches what's seen on the screen, or textual reports. Nor do the screenshots reveal all the options that are available. For example, it is possible to exclude corners and/or margins and/or arbitrary rectangles from consideration when comparing, which is ideal for excluding timestamps. It is also possible to compare ranges of pages to account for inserted and deleted pages. All DiffPDF's functionality is explained in the manual, and, of course, you can try it before buying it. By default, change bars are shown in red, and changes are highlighted with deletions in red, insertions in cyan, and replacements in magenta. In this example, the red and cyan highlighting indicates text that has moved (i.e., been deleted from one place and inserted in another). And the magenta highlighting indicates text that has been replaced in its original position. 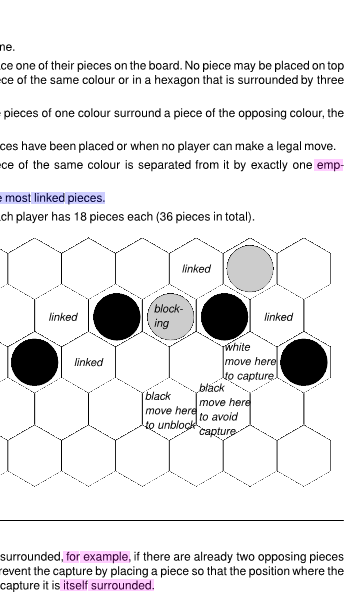 (Note that if plain rather than change highlighting is used—which is the default—all differences are shown in yellow.) All colors can be changed, as can the width of the change bar and many other things. 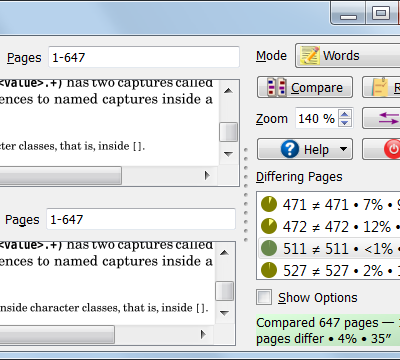 The image above shows what appears on-screen in DiffPDF's user interface. 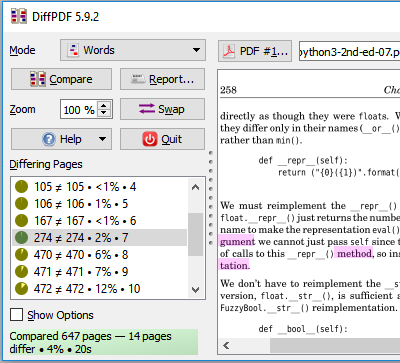 DiffPDF can also output PDF reports which contain each pair of differing pages with the differences highlighted as shown above. DiffPDF-5.9.1-amd64.msi (25 MB; MD5 d87498bfaede2fa8302ba2b64fe60c31). DiffPDF-5.7.0-amd64.msi (25 MB; MD5 2bc3c7dc5f71ae66ec46910faf8949c0). DiffPDF-5.6.8-amd64.msi (25 MB; MD5 cb46cb6e5871368d8923b0e0f917568b). DiffPDF-5.5.2-amd64.msi (24 MB; MD5 55cb39ee83d8d9b9eecd5d97cf287eae). DiffPDF-5.3.1-win32.msi (21 MB; MD5 6c17b5877565a7caff0a4e2ccce6fc41). DiffPDF-5.2.1-win32.msi (21 MB; MD5 c8c391f336e8388548c291e0d4b28ea1). DiffPDF-5.1.2-win32.msi (21 MB; MD5 82bf11d9ecaf868eb3c11a1059d4e000). DiffPDF-5.0.0-win32.msi (21 MB; MD5 8938c6fcafe7a5ed2425ac388342721f). DiffPDF-4.1.6-win32.msi (21 MB; MD5 ddc278b2acd7cda3f0828e87aa4c9c64).